One more year together and I feel like I'm learning something from Zodd every day. I am fascinated by the history of the breed and of how the centuries spent on the plains of Tibet shaped the TM into what it is today. This is a breed to love, live with and learn from. I've been around dogs all my life, I've had dogs the last eleven years of my life and I've been very active in the dogworld, meeting alot of different breeds of all sizes and origins, but I have never before understood how important it is to look at the background of a dog to truly understand its behaviour. A TM will not act like a German Shepherd or a Chihuahua because they've been bred for totally different purposes. 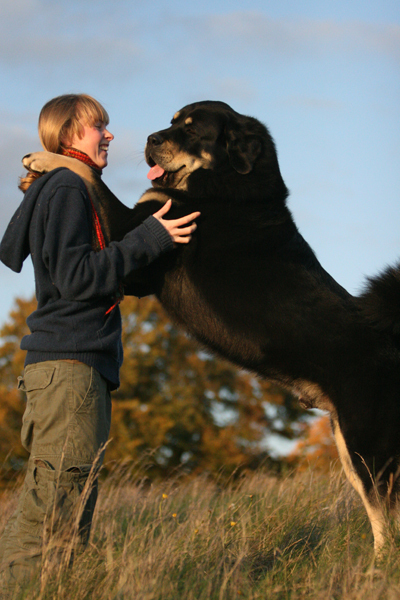 The history of the Tibetan Mastiff is not only lines in a book of a past long gone, it's alive in every TM out there and it's something we must never forget.